Study shows the Arctic was much colder while Earth was warmer during Eemian warm period | Watts Up With That? Warm Climate – Cold Arctic? 12.06.2012/Kiel. The Eemian interglacial period that began some 125,000 years ago is often used as a model for contemporary climate change. In the international journal “Geophysical Research Letters” scientists from Mainz, Kiel and Potsdam (Germany) now present evidence that the Eemian differed in essential details from modern climatic conditions. To address the question about how climate may develop in the future, earth scientists direct their attention to the past. They look for epochs with similar conditions to today. The major identified climatic processes are then simulated with numerical models to further test possible reactions of the Earths’ system. An epoch which is often regarded suitable for such an undertaking is the Eemian warm period, which began around 125,000 years ago following the Saalian ice age. For about 10,000 years, average temperatures on Earth in the Eemian were rather enhanced – probably several degrees above today’s level. This seems to be well documented in both ice cores as well as terrestrial records from land vegetation. Substantial parts of the Greenland ice had melted, and global sea level was higher than today. 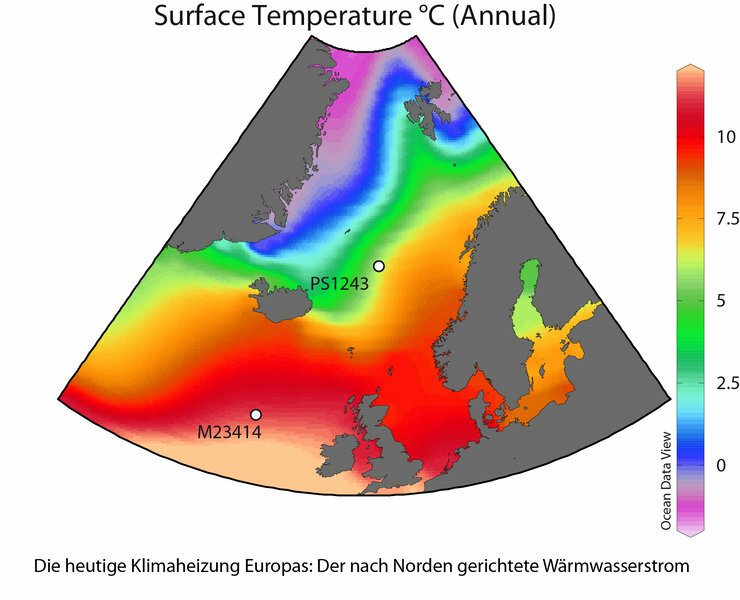 “Therefore, the Eemian time is suited apparently so well as a basis for the topical issue of climate change”, says Dr Henning Bauch, who works for the Academy of the Sciences and the Literature Mainz (AdW Mainz) at GEOMAR | Helmholtz Centre for Ocean Research Kiel. However, in a study which appears in the recent issue of the international journal “Geophysical Research Letters” Dr Bauch, Dr Evgeniya Kandiano of GEOMAR as well as Dr Jan Helmke of the Institute for Advanced Sustainability Studies in Potsdam now show that the Eemian warm period differed from the present day situation in one critical aspect – the development in the Arctic Ocean. Dr Bauch’s group examined sediment cores from the seabed in which information about the climate history of the past 500,000 years is stored. These come from the Atlantic to the west of Ireland and from the central Nordic Seas to the east of the island of Jan Mayen. The sediments contain minute calcite tests of dead microorganisms (foraminifers). “The type of species assemblage in the respective layers as well as the isotopic composition of the calcitic tests give us information about temperature and other properties of the water in which they lived at that time“, explains Dr Bauch. 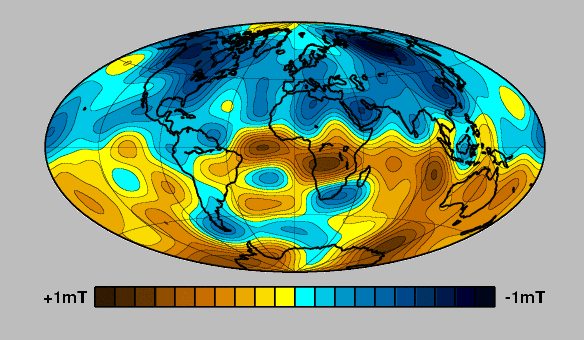 On the one hand, the study introduces new views on the Eemian climate. On the other hand, the new results have consequences for climatology in general: “Obviously, some decisive processes in the Eemian ran off differently, like the transfer of ocean warmth towards the Arctic. Models should take this into consideration if they want to forecast the future climate development on the basis of past analogues like the Eemian “, says Dr Bauch. Source: Joint press release of the Academy of the Sciences and the Literature Mainz and the GEOMAR | Helmholtz Centre for Ocean Research Kiel. Studies in the last years have shown that the oceanic heat transport to the Arctic has even increased, while the summer sea ice cover in the Arctic Ocean seems to be decreasing continuously. A warmer world results in more poleward and zonal jetstreams. The consequence is to cut off the poles from ingress of warm air and egress of cold air because such movements of air are more associated with meridional jetstreams. That is why the Antarctic became colder during the recent warming spell. The Arctic is different because of the flow of warm water into the Arctic Ocean. One could envisage a scenario whereby a much warmer period could result in much colder poles so that the cold air at the Arctic could cause year round ice cover on the Arctic Ocean which would prevent energy loss from open water during the Arctic summer. That would effectively turn off the ‘outlet valve’ for energy moving from the Atlantic into the Arctic Ocean so the entire flow of warm water under the Arctic Ocean would come to a halt with the backing up of the energy flow causing an anomalously warm north Atlantic. What this work and the recent article about the Younger Dryas period suggest to me is that when you’re thinking about the earths climate system as a whole then you have to think there have many different versions of the climate system over the epochs. Each time the experiment has been run with a tweaked set of parameters, the problem being we can’t always be sure just which parameters have been tweaked and in what way. It seems a caveat has to be added every time do try to make comparisons between different periods. For example It’s always struck me as a possible flaw when inferring climate sensitivity from comparison with the past.. It would be interesting to know if the Arctic cooling shown in the ice core that is about equidistant between Iceland and Norway, NW of Iceland, applied elsewhere, or was localized phenomenon. The authors, in the Discussion section, suggest that this cooling might be local to the Nordic seas, but do not conclude that. If the cooling was local, then other parts of the Arctic — meaning the portions N of Alaska and the Canadian Arctic — might have been warmer than today. More cores would have to be utilized, specifically in these areas, to know how widespread the cooling was. Arctic hold the key to understanding global temperature oscillations. orbital eccentricity over 4%, causing huge semiannual insolation changes. it was 17%, a giant stimulus for unstable weather. This was why agriculture didn’t start back then: undependable weather. yet it wasn’t all that much smaller than today. A little bit of CO2 can’t possibly bring back the Eemian. Selection from randomly generated proxies. You need to screen to find what is a proxy. Billions of trees do not have a temperature signal. Some do. You have to screen somehow to find which ones they are. Still peddling your nonsense, eh? Changes in the short term Bz of the Earth’s magnetic field intensity are due to the solar wind expressed as the maximum intensity of the individual geomagnetic storms as indicated by the Ap max. The long-term changes derive from changes in the Earth’s core and has nothing to do with the solar wind, magnetic storms, or SSN. If sea level rose enough to flood florida, for example, the Gulf Stream would point more towards Greenland and if the flow is enhanced, would melt everything in its path. That would turn Greenland into a Temperate climate zone, yes? My point is that a rise in sea level (however caused) could/should warm Greenland far more than an air temperature change. Re your first link and North magnetic poles: is there a corresponding chart for the South Pole? As the temperature change in Antarctica is different, but your described correlation (possible mechanism) is constant, I am interested to know what is happening ‘down there’. Changes in the short term Bz of the Earth’s magnetic field intensity are due to the solar wind expressed as the maximum intensity of the individual geomagnetic storms as indicated by the Ap max. The long-term changes derive from changes in the Earth’s core and has nothing to do with the solar wind, magnetic storms, or SSN. Where would you put the border between the short and long term? It has been said on a many occasion ‘it is the sun stu…..’, indeed it is but not the way anyone expected! “(1)__The Arctic is different because of the flow of warm water into the Arctic Ocean. The focus on the Gulf current is essential to under stand alt least a bit of climatic features (1). But there are presumably a dozen, or more scenarios (particularly subsurface conditions) that may change any global climate trend (2). E.g. one windless winter season in the Norwegian Sea may be enough to trigger a complete icing, which does not diminish during the following summer season. We know much to little about how the interchange between the North Atlantic and the Arctic Ocean (http://www.arctic-warming.com ) is relevant on our climate concern. I really don’t know much about Antarctic (or anything else, as my dear friend up the thread might say). I think the Circumpolar current plays a flywheel role and stabilizes the climate of the entire region. As far as the Earth’s magnetic field is concerned, until it has been shown otherwise, I would suggest consider it only as a useful proxy, there are specific reasons why this may be true more for the Arctic than elsewhere. and carefully scan across and compare two globes in the middle of the page). The science is settled. We were promised warmer and colder Arctic. Climate science is wonderful. This study is a little ambiguous. One species of foram shows a warmer far north atlantic in the Eemian while another shows about the same as the Holocene. Basically, 90% of the proxies have the Eemian more than 2.0C warmer than the current interglacial so the weight of the evidence is …. The Earth’s magnetic field in the north is split up in two poles (one west of Hudson Bay and one in the central Siberia), while the south has a single pole, just outside Antarctica’s landmass, i.e. the Earth’s field it is a Y shape. Hit it with a strong magnetic storm, Antarctica will follow (hence http://www.vukcevic.talktalk.net/Aa-TSI.htm ) but Arctic will oscillate, a bit like a tuning fork. Again, this is nonsense. The Earth’s field where it is generated [in the core] is very complicated with many ‘poles’. As you move away from the core, the higher order poles die away much faster than the low order poles [the strength of a pole of order n falls of as 1/r^(n+1)], so the field becomes simpler and simpler with distance. In the magnetosphere [high above the surface] where the interaction between the solar wind and the Earth takes place [the geomagnetic storm] only the dipole is left. There are no oscillations [‘as a tuning fork’] of the interior field. It is not that the Eemian provides a poor analogue but that their concept of it is contrary to the facts of meteorology. A warmer earth necessarily warms 3-5 times more at the poles than the equator due to the efficiency of heat transport. It is not primarily the ocean but the atmosphere that transports the heat poleward. Recall that past climate changes are often claimed to support model’s sensivities. But it is quite clear that the factors which have caused past changes don’t work the way CO2 allegedly does. How can anyone claim we should expect the response to be comparable? Can you have hippopotamuses on the Thames and year round ice in the Arctic? There are no oscillations of the interior field. “Their analyses isolated six slow-moving oscillations, or waves of motion, occurring within the liquid core. The oscillations originated at the boundary between Earth’s core and its mantle and traveled inward toward the inner core with decreasing strength. Four of these oscillations were robust, occurring at periods of 85, 50, 35 and 28 years. Since the scientist’s data set goes back to 1840, the recurrence period of the longest oscillation (85 years) is less well determined than the other oscillations. The last two oscillations identified were weaker and will require further study. The 85- and 50-year oscillations are consistent with a 1997 study by researchers Stephen Zatman and Jeremy Bloxham of Harvard University, Cambridge, Mass., who used a different analysis technique. A later purely theoretical study by Harvard researcher Jon Mound and Bruce Buffett of the University of Chicago in 2006 showed that there should be several oscillations of this type; their predicted periods agree with the first four modes identified in Dickey and deViron’s study.” End quote. You are confused about the time scales. Of course there are dynamo waves on time scales of many decades and centuries, but not on the time scale of geomagnetic storms which you propose drive the changes in the main field. Here is what the core boundary field looks like http://www.leif.org/research/Magn-Field-Core-Boundary.png . Note that the field is much stronger [a million nT] than at the surface [50,000 nT]. No ‘tuning’ fork here. You still display a strong learning disability. To see why this is dead wrong you need only consider the concept of skin-depth. This is the distance an external disturbance will travel into a medium. The skin depth depends on the conductivity of the medium and the frequency of the disturbance variation. For periods around one day [typical for a geomagnetic storm] the lower mantle has a skin depth of about 50 km, while the outer core has a skin depth of only 200 meter. So it is impossible for geomagnetic storms to penetrate into the core and change anything. The prevailing dogma is that the north atlantic drift maintains climate warmth and – as per “Day after tomorrow”, cut off of this current spells catastrphic freezing. Humans have evolved on this planet and have surpassed the natural world. We are responsible for filling every corner of the land. …….. . Energy and the possession of natural resources that we know are detrimental to life, such as oil, coal, gas, and uranium all pollute the earth, warm the atmosphere, and have nearly sealed our fate. So please go find a cave to live in and leave the rest of us alone. PS Hansen says CO2 is detrimental to life. Do you breath? johnpnts has challenges in his life, as mentioned on 16th January 2012 in his “Free Energy Now” website. As energy can be neither created nor destroyed, I suspect what he really wants is free fuel. It’s all a bit sad. Better to be thought a fool than to disclose one’s beliefs and confirm opinion. I now have a question for you: Please name one country or epoch where the above can be true and there is NO imbalance in wealth. Good Luck. I know all of that, could be ‘geomagnetic storm’ as in http://www.vukcevic.talktalk.net/LFC2.htm but we don’t want to go there. From the Andy Jackson’s data it can be calculated that the strongest spectral component is at exactly 21.28 years (its timing is curiously about 7 years after the even number SC max) , second strongest component is found in the Arctic only, and it doesn’t appear to be harmonic/sub-harmonic of the solar output, so I concluded it has to be a local resonance associated with effect of two NH’s poles. I will write a bit more about what I found in the data, and then you can have another go at it. The reverse would appear to be also true as during an ice age the Arctic is warmer. Settlements of surprisingly large populations in the arctic from the time of the last ice age, and the transit of people into North America would support the fact. So far as I have seen, the poles get colder when the Earth gets warmer save that in the Arctic warmth gets into the Arctic Ocean via water flowing in from the north Atlantic. The greatest warming would be on the equatorial side of the jetstreams that separate equatorial from polar air masses as the jets get pushed poleward in the warming world. The increased vigour and zonality of the jets necessarily involves greater temperature contrasts either side. We clearly saw more poleward jets during the late 20th century warming spell and the Antarctic became colder. If the poles warmed so much more than the equator then the pole to equator temperature differential would become smaller and the jets would become weaker, more meridional and more equatorward which has not been seen to happen except during cooling periods such as the LIA (and now?). So, the pattern actually seems to be little (if any) warming at the equator, cooling at the poles and most warming on the equatorial side of the mid latitude jets with an enhanced temperature contrast across more poleward jets. I would guess that at a certain level of jetstream vigour and zonality the enhanced westerly flow would start to inhibit the currents flowing poleward past Spitzbergen thus cutting off the flow of warm water into the Arctic and thereby producing the scenario described in the above findings with a permanent summer long ice cap at the Arctic pole. Correct in my opinion. More meridional jets allowing more warm air into Arctic regions so the pattern then would be little (if any) cooling at the equator, most cooling on the equatorial side of the mid latitude jets with a reduced temperature contrast across more equatorial jets. That way natural climate change gives us colder mid latitudes with more snow and ice cover during ice ages but with warmer poles and during interglacials we see warmer mid latitudes with less snow and ice cover and colder poles. The Arctic behaves differently to the Antarctic and bucks the cooling trend during a general warming period but only until enhanced westerlies disrupt the poleward flow of warm water into the Arctic Ocean. That scenario seems to fit all the observations I am aware of. Compare first the colder and warmer CET winter months with the LT, then have a look what happens at summer month extremes too. This may also imply that cooler mid latitude summer months could also see greater Arctic summer ice loss. it doesn’t appear to be harmonic/sub-harmonic of the solar output, so I concluded it has to be a local resonance associated with effect of two NH’s poles. Again, you are spouting nonsense. There are no resonances associated with ‘two poles’. What you see at the surface is not at all what is present in the core where the generation and maintenance of the field takes place. ‘Local’? The only thing that makes sense is ‘local’ in the core. The surface is just an arbitrary location. It is not so hard to envision a tight, zonal flow that would keep the cold locked up in the arctic. What I want to see modled is a flow that would only warm the Vikings in Greenland, and have the MWP happen no other place. When I was asked to swallow that idea I gagged. My understanding is that they did attempt to modle a flow that looped up to Greenland and back down, and stayed that way for a couple hundred years, but the computer began smoking and then exploded. Totalitarianism also has issues with its track record and “worldwide impacts” on millions of human beings killed for political expediency. Feel like snuggling up to Hitler, Stalin, Mao etc. in your prescription for ideal world government? Bring it on, mate. Adolph Hitler is the founder of your modern green movement. We kicked over your fascist sand-castles last time with the help of the Russians, and by God we’ll do it again. Then the question is as to what causes the changes in the AO and AAO to lead the jets to become more meridional or zonal. Recent observations of the quiet sun relative to that of the late 20th century strongly suggest that the positivity or negativity of the polar oscillations is solar induced. Presumably this study into the divergent Eemian climate and the absence of the North Atlantic Drift (NAD) points to the strong climate-driving influence of ocean currents, rather than atmospheric winds. Bill Illis for instance reminds us that the current glacial epoch was started about 20 MYa by the isolation of Antarcica and establishment of the southern circumpolar current. Of course there must be some teleconnection between ocean currents and the jet streams and atmospheric oscillations. This no doubt goes both ways but I would have thought the story here is more about ocean currents’ influence. That is certainly involved since warmer SSTs in the tropics will push the jets poleward making them more zonal in the process. 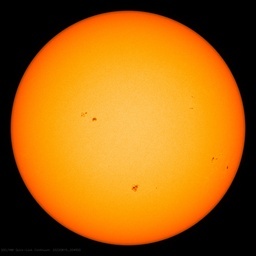 However we are seeing that the level of solar activity also affects AO and AAO. Thus my proposal that we have to integrate both influences such that the average position of the jets at any given time is a consequence of the netted out interaction between both bottom up oceanic and top down solar influences. In the longer term solar effects have primacy because they supply the oceanic energy content in the first place. Good comment, but those two words are not the same, in pronunciation, meaning or spelling. breathe -rhymes with seethe. Verb. breath -rhymes with Beth. Noun. solar effects have primacy because they supply the oceanic energy content in the first place. And because they are external to the planet’s dynamics. Internal processes, one way or the other, are zero-sum, robbing Peter to pay Paul. More of your persistent nonsense.